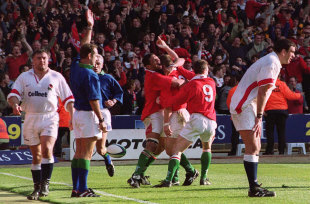 As rugby takes another trip to Wembley with Saracens' fixture against Northampton, one match invariably comes to mind - the last Five Nations match of all in 1999. The image of Scott Gibbs tearing through England's defence for a last-gasp try that secured Wales's only victory over the old - and then very dominant - enemy between 1993 and 2005 decorates many Welsh living rooms. For lifelong soccer fan Matt Dawson, the dream of playing at Wembley became a nightmare: "I don't think of all those May Saturdays of my youth watching cup finals…I think of Scott bloody Gibbs." If that is the great - or dreadful according to perspective - memory of Wales's six-game stay at Wembley, it can be argued that other matches were at least as important. Two in particular stand out. A year earlier Wales had entertained France on the final day of the Five Nations, with a rather different outcome. France's 51-0 victory rounded off a season in which the competition really appeared to be dividing into two divisions - it was their second score of more than 50 during the season, following a Murrayfield massacre on the same day that England were hammering Wales 60-26 at Twickenham. That all three results might be reversed the following season, and that Scotland would be champions, scarcely entered the minds of those of us who were pointing out that the tournament has always moved in cycles, let alone others who noisily proclaimed that there was no point in England and France continuing to play the Celtic trio. France were inspired at Wembley from the moment that the London Welsh choir - whose role in the pre-match build-up was to reinspire the singing that had become more legend than practice in the final years at the National Stadium - committed the tactical error of a rousing rendition of the Marseillaise. What followed had Welsh fans echoing the old joke, originating in the Scotland - South Africa massacre of 1951, that 'we were lucky to get nil'. Thomas Castaignede, then in the early stages of his peroxide phase - ran amok in as fine a display of attacking outside-half play as any stadium has seen. France scored seven tries, with Jean-Luc Sadourny and Xavier Garbajosa claiming two apiece. One was scored by a forward, Thomas Lievremont, playing in the back row alongside brother Marc. It could have been more. France visibly eased off in the last quarter while close refereeing calls generally went Wales's way. It was the end for coach Kevin Bowring, whose attempt to find a distinctively Welsh way of playing had lost its way comprehensively a few weeks earlier at Twickenham - Wales's loss, since his thoughtful and imaginative work has since been largely in the service of the Rugby Football Union. What followed, after an interregnum incorporating the slaughter of an under-strength squad in South Africa and an unholy shambles that gave Mike Ruddock the perfect right - not exercised - to sue the WRU for breach of contract, was the appointment of Auckland coach Graham Henry, on a salary reported at £250,000 per year. Henry's debut as an international coach was against South Africa at Wembley the following November. Five of the Welsh starting XV from the French game survived, only three in the same positions. Wales began astonishingly well. Mark Taylor broke on the right, Shane Howarth's quick hands drew the final defender and Gareth Thomas went over in the corner. Neil Jenkins missed the conversion, but was successful with three penalties as Wales went into a barely credible 14-0 lead. By half-time the South Africans were back on terms. Australian referee Stuart Dickinson awarded a penalty try described even by a South African television commentator as 'a soft decision' as the Springbok pack rolled a scrum towards the Welsh line with the ball at skipper and No.8 Gary Teichmann's feet. Then a Springbok attack concluded with a Pieter Rossouw break and scrum-half Joost van der Westhuizen timing his arrival and burst perfectly to slice through to the line. Franco Smith converted both tries and it was 14-14 at the break. With Welsh memories still fresh of the similarly dynamic start - two brilliant tries and a 14-7 lead - before the collapse at Twickenham, nobody would have been terribly surprised to see a similar pattern at Wembley. Instead Wales hung on and stayed in contention, with Jenkins and Smith exchanging penalties to make it 20-20, until late in the game when van der Westhuizen made a typically greyhound-like break that was halted by the corner flag, but sucked in so many Welsh defenders that a simple offload sent flanker Andre Venter over. South Africa won 28-20, but Welsh fans went away delighted, feeling that a transformation was underway. A couple of hiccups were to follow - a defeat at Murrayfield followed by a shockingly shoddy Wembley loss to Ireland - before victories over France and England confirmed that something really had changed. It was the Wembley match against South Africa, though, that truly launched the idea of Graham Henry as the 'Great Redeemer'.